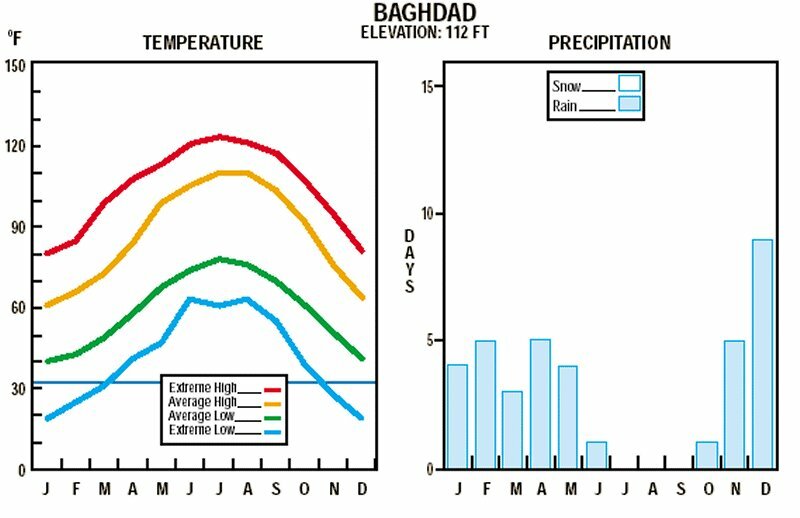 The average temperatures in Iraq range from higher than 48 degree C (120 Fahrenheit) in July and August to below freezing in January. 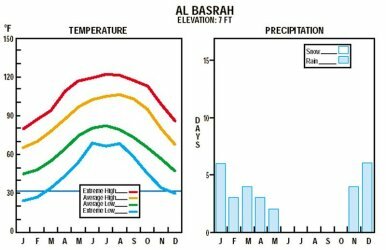 A majority of the rainfall occurs from December through April and is more abundant in the mountainous region and may reach 100 centimeters a year in some places. The summer months are marked by two kinds of wind phenomena: the southern and southeasterly sharqi, a dry, dusty wind with occasional gusts to eighty kilometers an hour, occurs from April to early June and again from late September through November; the shamal, a steady wind from the north and northwest, prevails from mid-June to mid-September. 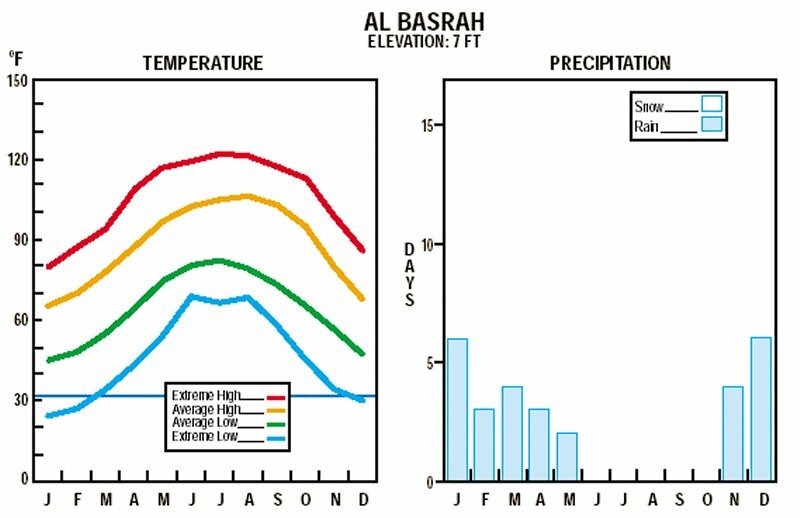 Very dry air which accompanies the shamal permits intensive sun heating of the land surface but also provides some cooling effect. Dust storms accompany these winds and may rise to height of several thousand meters, causing hazardous flying conditions and closing airports for brief periods of time. Extremes of temperatures and humidity, coupled with the scarcity of water, will effect both men and equipment. During dry season, clouds of dust caused by vehicle movement will increase detection capabilities in desert regions. Flash flooding in wadis and across roads will hinder trafficability and resupply efforts during the rainy season. Clear, cloudless skies make air superiority a prerequisite to successful offensive operations throughout Iraq. Air operations may be reduced during windy season. 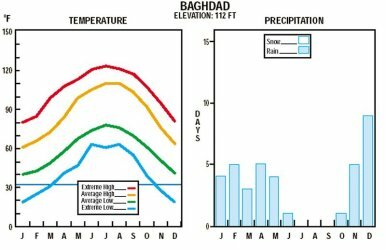 The Iraqi climate is similar to that of the extreme southwestern United States with hot, dry summers, cold winters, and a pleasant spring and fall. 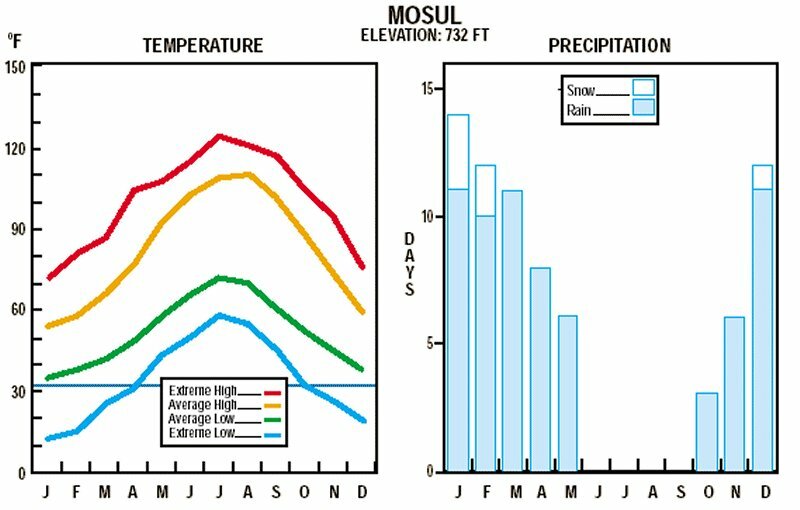 Roughly 90% of the annual rainfall occurs between November and April, most of it in the winter months from December through March. 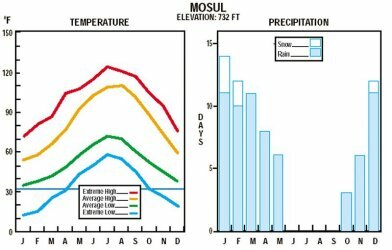 The remaining six months, particularly the hottest ones of June, July, and August, at approximately 102° F (32° C), are dry. The influence of the Persian Gulf on the climate of Iraq is very limited. Near the gulf the relative humidity is higher than in other parts of the country. In the western and southern desert region, the climate is characterized by hot summers and cool winters. This region also receives brief violent rainstorms in the winter that usually total about 10 centimeters (cm). Most nights are clear in the summer, and about one third of the nights are cloudy in the winter. In the rolling upland (foothill) region there is basically no precipitation in the summer and some showers in the winter. The winter rainfall normally averages about 38 centimeters (cm). The nights are generally clear in the summer and in the winter dense clouds are common about half of the nights. 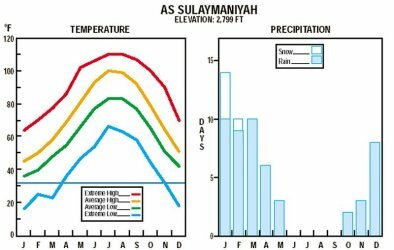 The alluvial plain of the Tigris and Euphrates Delta in the southeast receives most of its precipitation accompanied by thunderstorms in the winter and early spring. The average annual rainfall for this area is only about 10 to 17 cm. Half of the days in winter are cloudy, and in the summer the weather is clear most of the time. In the mountains of the north and northeast the climate is characterized by warm summers and cold winters. 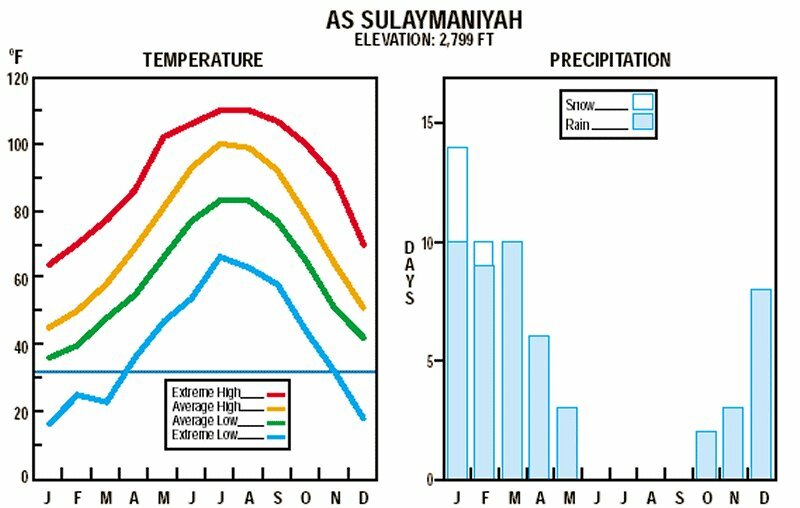 Precipitation occurs mainly in winter and spring, with minimal rainfall in summer. Above 1,500 m, heavy snowfalls occur in the winter, and there is some thunderstorm activity in the summer. Annual precipitation for the whole region ranges from 40 to 100 cm. Few nights are cloudy in summer and about half of the days are cloudy in winter.